Grace Dickinson's Simply Roasted Eggplant recipe at Food~Fitness~Fresh Air. Put oven on "broil" setting and preheat for a few minutes. Put red pepper quarters skin side up on a foil-lined baking sheet and place on top shelf of oven until tops are blackened and charred (10–12 minutes; check every 2 minutes). Meanwhile, begin cooking onion, hot pepper and a generous sprinkling of salt over low heat in oil until onion is translucent and tender. While peppers are broiling and onions are cooking, brush both sides of eggplant slices with olive oil and lay on a separate foil-lined baking sheet. Take one piece of garlic per slice and embed it as best you can in the flesh of the eggplant. When peppers are done, remove them from oven and set oven to 500ºF. Take peppers from baking sheet with tongs and place in a plastic zip bag to steam for 15–20 minutes. While peppers are steaming, place pan of eggplant slices in oven for 15–20 minutes or until they are just beginning to brown. Toast walnuts for a few minutes over medium heat, stirring frequently. Remove charred skin from red peppers. Place cheese and walnuts in food processor and chop until reduced to coarse crumbs. Add onions, hot pepper and parsley and process again. Add eggplant slices (with or without roasted garlic pieces) and process until the pesto begins to come together. Add red peppers and a sprinkling of salt and (optional) a dash of black pepper and process until it forms a thick paste. Drizzle in extra-virgin olive oil. Correct salt, add more grated cheese if necessary and process until fairly smooth and uniform. Serve over hot pasta with grated Grana and Pecorino. Best with a convoluted pasta like rotini or farfalle. If serving pesto with a smooth pasta, reserve a ladleful of the pasta-cooking water to thin the pesto and help it adhere. If pesto is too spicy, discard some or all of the seeds from the hot pepper before combining with onion, or use a milder pepper such as a jalapeño. Fantastic with a splash of vinegar as the dressing for a cold pasta salad. Also delicious hot or cold with quinoa. Peppers To roast the peppers and the hot pepper whole, cut peppers into quarters, remove the seeds and the membranes and roast the peppers in pre-heated oven at 500 degrees F (260 degrees C).until the skin blisters and turns black. Remove from oven and cover with plastic, or a tea towel, or place in a paper bag until cool. The skins should peel away off of the peppers easily when cooled. Put them in a plastic zip bag to steam. When they are cool enough to handle, prepare the red peppers by pulling the stem and innards out and pulling/scraping off the charred, loose skin. Open up and rinse out any remaining seeds. Prepare the hot pepper by cutting the stem off. (For a milder pesto, also remove some or all of the seeds.) See Roasting Peppers recipe from AllRecipes.com which shows photos. Onions For roasting the onions, put unpeeled whole onions on a baking sheet. and roast in oven at 425ºF for one hour, or until the skins are deep golden brown and blistered and the inner parts are very tender throughout and yield when pierced with a sharp knife. This will take an hour or longer, depending on the size. See Whole Roasted Onions by Andrea Reusing at Leite's Culinaria. When onion is cool enough to handle, peel off very outer layers and chop roughly. 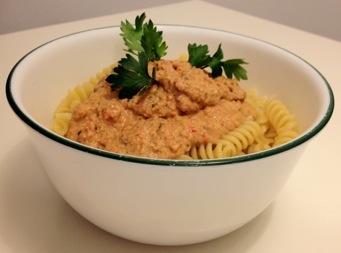 Source: "Alone and Unobserved" blog by librarian Sean "Pesto alla Calabrese con Peperoni e Melanzane Arrostiti (Roasted Red Pepper/Eggplant Pesto)"